This week’s topic is “Challenging” and it is challenging, so to speak. I have certain ancestors I don’t know much about and haven’t had much luck in the research of them. I haven’t delved deep enough, so to speak, into their past. I’m certain there are most likely documents to help me should I be patient enough to take the time to research further. Mariah Sherman Clanin was my 3rd great grandmother. She was born in Ohio in 1813 to Thomas R. Sherman (1792-1847) and Lavinia Barr (1791-1817). I have always been a great lover of history and especially the American Civil War. Obviously, my mind first went to the fact General William Tecumseh Sherman was born in Ohio in 1820 and I’ve wondered ever since if we weren’t somehow related. I’m still wondering and searching. Mariah married Edwad Clanin while living in Ohio and they later moved to Fulton County, Illinois. William Tecumseh Sherman was born in February of 1820 in Ohio to the Hon. Charles Robert Sherman (1788-1829) and Mary Hoyt (1787-1852). “Cump” Sherman as he was affectionately known to family members had several siblings: Hon. Charles T. Sherman, Mary Elizabeth Reese, James Sherman, Amelia McComb, Julia Ann Willock, Lampson Parker Sherman, John “The Ohio Icicle” Sherman – U.S. Senator and U. S. Secretary of Treasury & State, Susan Denman Sherman, Hoyt Sherman and Frances Beecher Moulton. My great grandmother also had many siblings and half-siblings: John C. Sherman, Sarah Sherman, Lavinia Sherman, Margaret N. Sherman, Amanda Sherman, Andrew Sherman, Nancy Sherman, and James Sherman. None seem to match up with any of “Cump” Sherman’s. Several of the given names are similar between families, but they also are not that unique to be a factor in connecting the two families. Mariah died in 1890, four years prior to Edward’s death. She was 77 years old at her death. I believe this photo was probably taken not too long prior to 1890. She seems to be holding spectacles in her right hand. Edward is holding some sort of paper. It is known that he served in the Army during some war with Indians as a family member has a buffalo coat he gained during that war. Perhaps he had difficulties with his hands due to age. Mariah is pretty challenging. I intend to keep working on her to match her up, hopefully, with William Tecumseh Sherman, but if I don’t find a connection, it certainly won’t change my interest in General Sherman. Who knows…if I got back far enough, I might find the connection! COMMENCEMENT – the act or instance of commencing; beginning. Eliza Jane Hulvey (b:5 April 1832 d:25 March 1885) was the 13th and last child born to Philip and Amelia (Walters) Hulvey of Augusta County, Virginia. She is my 3rd great grandmother and she is wrapped up in beginnings and endings. She ultimately had to face a commencement any woman who is a mother knows would be the last scenario you could withstand. Indulge me while I tell her somewhat complicated story. 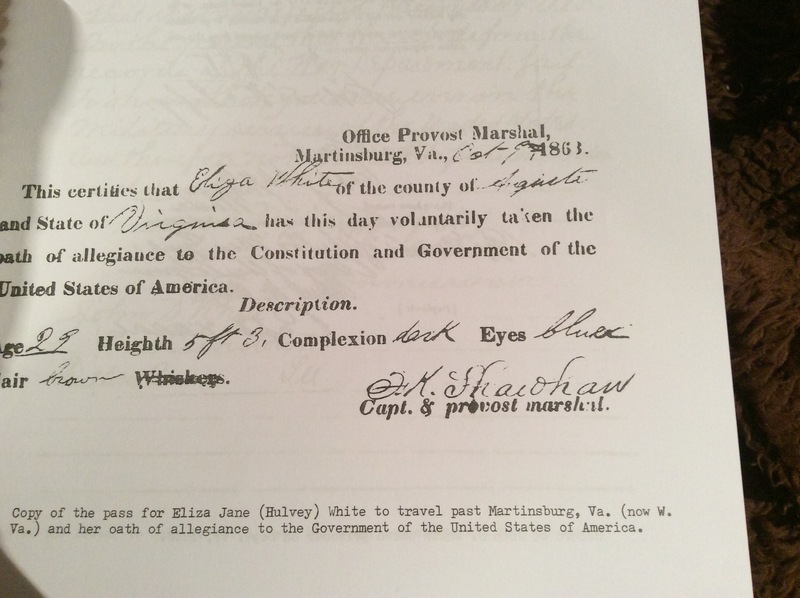 A marriage license was issued on 24 August 1854 for Eliza Jane Hulvey and John Sheets White. Eliza and John were both 22 years old at the time. However, their first child is listed with a birthdate in 1853. Did they not apply for the actual license till much after the ceremony was performed? That question is yet to be answered. Their children were Mary Agnes White (b. 1853), an infant that died at birth in 1855, John Newton Ellisander White (b. 1856), James William White (b. 1857), Pricilla Emma White (b 1858) and Della Margaret White (b. 1860). Della was my 2nd great grandmother. 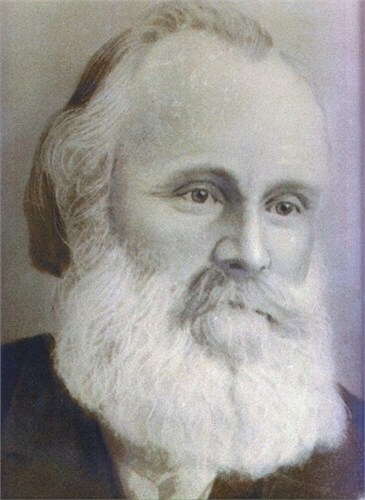 According to the book Hulvey Clan Historical Ties by Velma June Good Hulvey, (p. 301) “They left Virginia and lived for a short time in Ohio.” But family documents show John Sheets White listed as a Prisoner of War on September 27, 1862 after the Battle of Antietam during the US Civil War. The Battle of Antietam was held September 17, 1862. However, family records also show Eliza and the five oldest children were in Ohio during this same time period when they contracted diptheria. Legend has it an Indian woman nursed the family during their awful illness. Unfortunately, the four oldest children — Mary Agnes, John Newton Ellisander, James William and Pricilla Emma — all died from diptheria between the 2nd and 9th of September 1862. Only Della Margaret, the youngest and Eliza, her mother survived. Eliza went from having a family of five children and a husband, to a woman who was unsure where her husband was during the war and a mother who had lost four children. Records don’t help to bring this story into focus, though. We only know that on 25th September of 1863, Eliza and two small children were given an Army pass to travel to Winchester, Virginia. Della would have been one of the children. The next child born was Elly Walters White (b. 1861 d. 1865). If Elly was born in 1861, why was he not with Eliza and the other children when they contracted diptheria? The next record shows a pass in October of 1863 at Martinsburg, VA for Miss L. White on B & R Railroad good for one day only. An Oath of Allegiance to the United States of America accompanies the pass she received. The Oath describes her as “Age: 29, Height: 5 ft. 3, Complexion: dark, Eyes:blue, Hair:brown”. 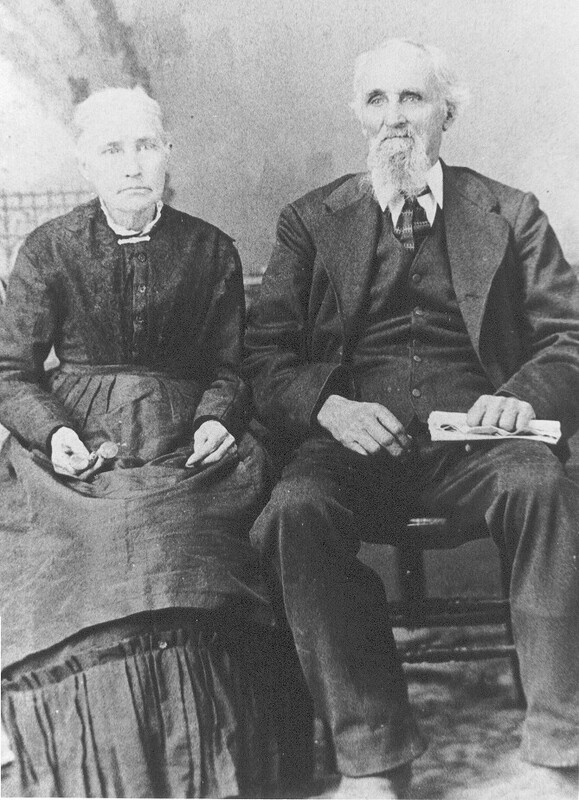 Not long after this John and Eliza must have been reunited as Robert Franklin White was born in August of 1864. By 1877, five more daughters and one son were born to John and Eliza. Their family moved to Illinois where they would someday be buried. The gaps in the records are still to be filled, but we know Eliza ultimately gave birth to 14 children in 23 years. The first four children died of diptheria. Della, the youngest at the time, survived to become the oldest of the remaining eight children who reached adulthood. The end of the Civil War was the beginning of a new life for Eliza and John where their family would set down roots and continue to grow. The commencement of a new life for her was not without its pain. Photography didn’t begin until the late 1820’s or early 1830’s. A Frenchman by the name of Joseph Nicephore Niepce is generally credited with taking the first photo. While I have many photos of family members, one of my favorite photos is not of an actual person, but instead of a simple military stone placed in his memory. Michael France was my 4th great grandfather. Born 6 October, 1776 in Frankin County, Virginia to John France and Mary “Polly” McTier. Michael France was born into the American colonies – a country that was in turmoil. The United States of America wasn’t formed yet. Nathan Hale had been executed a mere two weeks prior to Michael France’s birth. George Washington had finally won his first battle victory in the War for Independence at The Battle of Harlem Heights. The Marquis de Lafayette wouldn’t show up on the scene for another six weeks to assist the fledgling rebels. 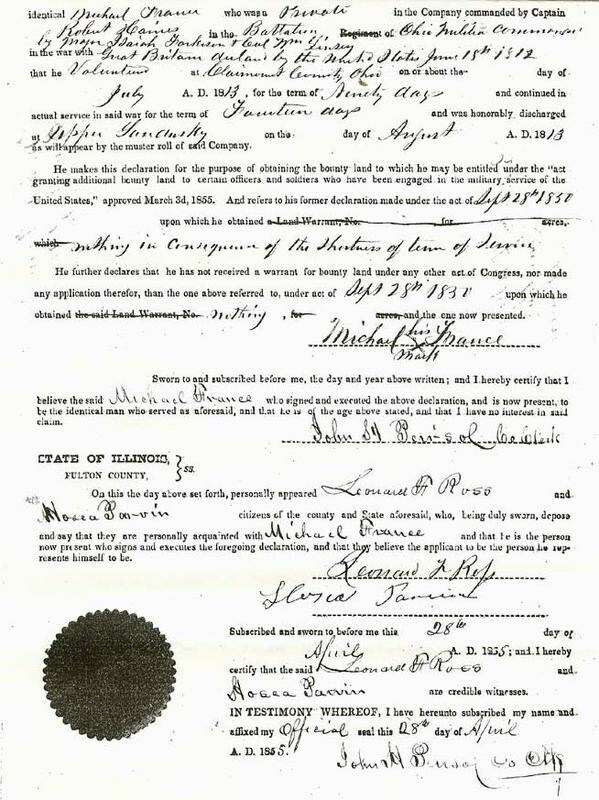 Michael France married Rebecca Henry 5 February 1798 in Franklin County, Virginia. They later had eight children – four boys (Orville, John, Jesse, Thomas Henry A.) and four girls (Anna, Elizabeth, Susannah and Jennette). Michael was mustered into service of the Haines’ Ohio Mounted Militia in 1812, leaving Rebecca with eight small children to care for. Michael France fought for Haines’ Mtd. Militia in Ohio during the War of 1812. In 1835, Michael and Rebecca moved to Illinois where they lived until their deaths. Michael died in 1867 at the age of 91 years old. He had lived through the Revolutionary War, the War of 1812 and came to Illinois soon after the Black Hawk War. In his lifetime, he’d seen the Mexican War in 1846 to 1848, the American Civil War and the beginning of the Indian Wars out west. So what was the significance of the photo of the military stone for Michael France? To me it is a simple reminder of a sacrifice my ancestor made to develop this strong country. It reminds also that John France served the new nation when Michael was only five years old. 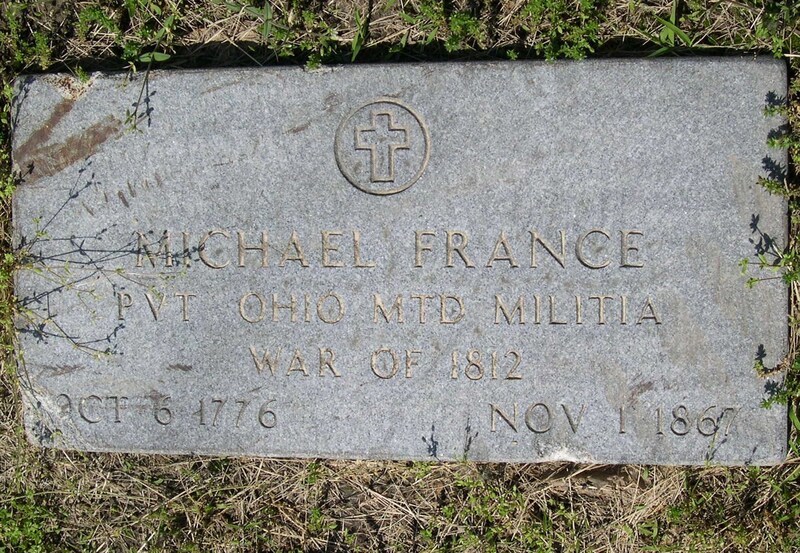 Michael France served his country when six of his eight children were age 10 and younger. It reminds me of how much history passed his eyes during his lifetime. It reminds me of the sacrifices of many military men during the many battles and wars America has fought. It reminds me those sacrifices are honored with a simple stone – strong, graceful, unyielding to wind, water and time. The photo reminds me I come from Patriot blood.